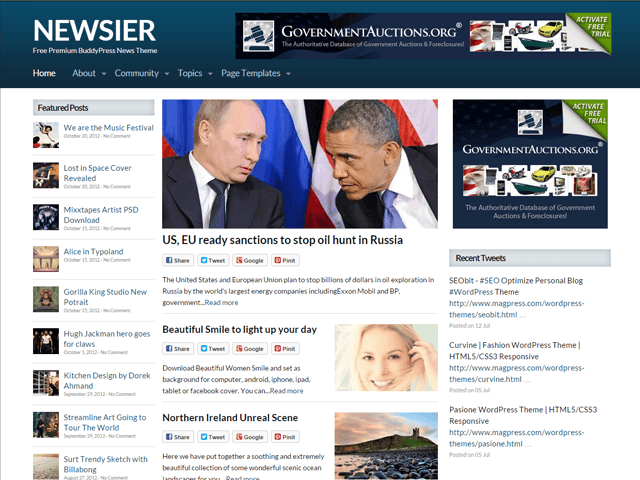 Newsier is a news magazine style WordPress theme with lots of features such as Google web font, advertisement option and many more. With content is king in mind, the homepage is built ready for 3 of your popular category posts to choose from theme options. You also will be able to setup a featured video in homepage via theme options. The theme also fully Responsive and mobile friendly, suitable for any website development that focus on mobile blogging, you could test them out in your mobile device such as ipad or iphone. 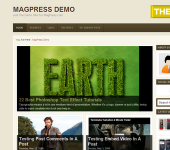 The theme also compatible with latest BuddyPress, Woocommerce and BBPress WordPress plugins. Checkout more Free Responsive WordPress Themes here. Hi again, I figured out what was wrong. Well no I didn’t figure it out. I started over and the second time it worked. Apparently there was something in the code of the text or something, I can’t imagine what that would affect some of the photos. Not all were affected. But it seems to be working Thanks for being there though (I know today’s a holiday) and all’s well that end’s well. I LOVE it. It is beautiful and works well for my http://www.fourflagsjournal.com. However I hit a snag. I use leadpages and I need to update to the next version of the Leadpages plugin. Every time I try it says intallation failed. Leadpages has tried for me and can’t figure it out and are suspecting it is the theme. 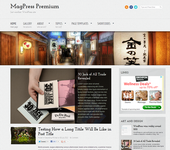 I came to Magpress to see if there is something I like but I really don’t want to change. Anybody have any ideas. My leadpages won’t work unless I figure it out. It worked for version 1 but is balking at Version 2. The leadpages technician suggested I deactivate my theme and then try. But after 2 1/2 hours of trying to figure out how to do that, I can’t. I can find all kinds of stuff about changing or deleting. But I don’t want to do either. Only deactivate to see if their suggestion will work. Hard to believe I built that whole web page and can’t figure this stuff out!! leadpages plugin should work out of the box on pages. the theme have page.php so it should work. new version might had conflict. php version maybe? I already did that. I’ve been working on this for days. I updated the PHP with GoDaddy’s help, everything is fine. Leadpages tried also and the wondered if there was a conflict with the theme. They suggested I deactivate the theme and THEN try it and then reactivate. Is it possible to just deactivate? The thing is the leadboxes work, leadpages doesn’t. Hey, I concur with the post on Nov. 15 — like the theme but I need a small slider. Do you have any recommendations? Thx. try check some of the latest themes demo, few of them had slider before post. like zonemag or drego. Hey there is Option for Feature Slider in Control Panel. But in Your site Demo and in my installed theme there is no SLIDER. Even after setting featured image and selecting slider category in panel still no slider appears.. Does this theme have slider in it ?? Hiya! I’m using the Newsier theme on the above web site and the menu bar links are not clickable more often than not. It’s taken several page refreshes to get the links to be clickable…then, they aren’t again. they are fine to me, tried it 10 times and everytime clickable. might be the site load issue, you need to wait for the site to load first before the supermenu js loaded. hello i have the free version on my website and i will like to purchase the theme , but i will like first to know the different between the free version and purchased version ? the developer version will have no credit link in footer or sidebar. the features are the same as free version. we tend not to limit or lock any features in free version so user can enjoy the same theme, only with footer credits. you need to attach ‘featured image’ in post or have at least 1 image inside post content for the featured thumbnail to show.